(a) You can shield a charge from electrical forces by putting it inside a hollow conductor. Can you shield a body from the gravitational influence of nearby matter by putting it inside a hollow sphere or by some other means? (b) An astronaut inside a small space ship orbiting around the earth cannot detect gravity. If the space station orbiting around the earth has a large size, can he hope to detect gravity? (c) If you compare the gravitational force on the earth due to the sun to that due to the moon, you would find that the Sun’s pull is greater than the moon’s pull. (You can check this yourself using the data available in the succeeding exercises). However, the tidal effect of the moon’s pull is greater than the tidal effect of sun. Why? (a) We cannot shiwld a body from the gravitational influence of nearby matter, because the gravitational force on a body due to nearby matter is independent of the presence of other matter, whereas it is not so in case of electric forces. It means the gravitational screens are not possible. (b) Yes, if the size of the space station is large enough, then the astronaut will detect the change in Earth’s gravity (g). (c) Tidal effect depends inversely upon the cube of the distance while, gravitational force depends inversely on the square of the distance. Since the distance between the Moon and the Earth is smaller than the distance between the Sun and the Earth, the tidal effect of the Moon’s pull is greater than the tidal effect of the Sun’s pull. (a) Acceleration due to gravity increases/decreases with increasing altitude. (b) Acceleration due to gravity increases/decreases with increasing depth. (assume the earth to be a sphere of uniform density). (c) Acceleration due to gravity is independent of mass of the earth/mass of the body. (d) The formula –G Mm(1/r2– 1/r1) is more/less accurate than the formula mg(r2– r1) for the difference of potential energy between two points r2and r1distance away from the centre of the earth. 8.3. Suppose there existed a planet that went around the sun twice as fast as the earth.What would be its orbital size as compared to that of the earth? Hence, the orbital radius of the planet will be 0.63 times smaller than that of the Earth. 8.4. Io, one of the satellites of Jupiter, has an orbital period of 1.769 days and the radius of the orbit is 4.22 × 108 m. Show that the mass of Jupiter is about one-thousandth that of the sun. Hence, it can be inferred that the mass of Jupiter is about one-thousandth that of the Sun. 8.5. Let us assume that our galaxy consists of 2.5 × 1011 stars each of one solar mass. How long will a star at a distance of 50,000 ly from the galactic centre take to complete one revolution? Take the diameter of the Milky Way to be 105 ly. ∴ 1.12 × 1016 s = 1.12 × 1016 / (365 × 24 × 60 × 60) = 3.55 × 108 years. (a) If the zero of potential energy is at infinity, the total energy of an orbiting satellite is negative of its kinetic/potential energy.  (b) The energy required to launch an orbiting satellite out of earth’s gravitational influence is more/less than the energy required to project a stationary object at the same height (as the satellite) out of earth’s influence. (d) the height of the location from where the body is launched? The escape velocity is indpendent of the mass of the body and the direction of projection. It depends upon the gravitational potential at the point from where the body is launched. Since, this potential depends slightly on the latitude and height of the point, therefore, the escape velocity depends slightly on these factors. 8.8. A comet orbits the Sun in a highly elliptical orbit. Does the comet have a constant (a) linear speed, (b) angular speed, (c) angular momentum, (d) kinetic energy, (e) potential energy, (f) total energy throughout its orbit? Neglect any mass loss of the comet when it comes very close to the Sun. A comet while going on elliptical orbit around the Sun has constant angular momentum and totaal energy at all locations but other quantities vary with locations. 8.9. Which of the following symptoms is likely to afflict an astronaut in space (a) swollen feet, (b) swollen face, (c) headache, (d) orientational problem? (a) Legs hold the entire mass of a body in standing position due to gravitational pull. In space, an astronaut feels weightlessness because of the absence of gravity. Therefore, swollen feet of an astronaut do not affect him/her in space. (b) A swollen face is caused generally because of apparent weightlessness in space. Sense organs such as eyes, ears nose, and mouth constitute a person’s face. This symptom can affect an astronaut in space. (c) Headaches are caused because of mental strain. It can affect the working of an astronaut in space. (d) Space has different orientations. Therefore, orientational problem can affect an astronaut in space. 8.10. 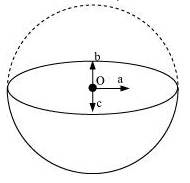 Choose the correct answer from among the given ones:The gravitational intensity at the centre of a hemispherical shell of uniform mass density has the direction indicated by the arrow (see Fig 8.12) (i) a, (ii) b, (iii) c, (iv) O.
Gravitational potential (V) is constant at all points in a spherical shell. Hence, the gravitational potential gradient (dV/dR) is zero everywhere inside the spherical shell. The gravitational potential gradient is equal to the negative of gravitational intensity. Hence, intensity is also zero at all points inside the spherical shell. This indicates that gravitational forces acting at a point in a spherical shell are symmetric. 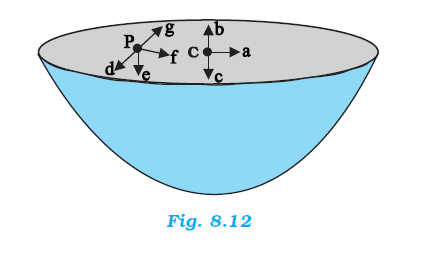 If the upper half of a spherical shell is cut out (as shown in the given figure), then the net gravitational force acting on a particle located at centre O will be in the downward direction. Since gravitational intensity at a point is defined as the gravitational force per unit mass at that point, it will also act in the downward direction. Thus, the gravitational intensity at centre O of the given hemispherical shell has the direction as indicated by arrow c.
If the upper half of a spherical shell is cut out (as shown in the given figure), then the net gravitational force acting on a particle at an arbitrary point P will be in the downward direction. Since gravitational intensity at a point is defined as the gravitational force per unit mass at that point, it will also act in the downward direction. 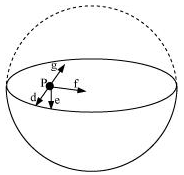 Thus, the gravitational intensity at an arbitrary point P of the hemispherical shell has the direction as indicated by arrow e.
Hence, the correct answer is (ii). 8.12. A rocket is fired from the earth towards the sun. At what distance from the earth’s centre is the gravitational force on the rocket zero? Mass of the sun = 2 ×1030 kg, mass of the earth = 6 × 1024 kg. Neglect the effect of other planets etc. (orbital radius = 1.5 × 1011 m). Let x be the distance from the centre of the Earth where the gravitational force acting on satellite P becomes zero. x = 1.5 × 1011 / 578.35 = 2.59 × 108 m.
8.13.How will you ‘weigh the sun’, that is estimate its mass? The mean orbital radius of the earth around the sun is 1.5 × 108 km. Hence, the mass of the Sun is 2 × 1030 kg. 8.14. A Saturn year is 29.5 times the earth year. How far is the Saturn from the sun if the earth is 1.50 ×108 km away from the sun? Hence, the distance between Saturn and the Sun is 1.43 × 1012 m.
8.15. A body weighs 63 N on the surface of the earth. What is the gravitational force on it due to the earth at a height equal to half the radius of the earth? = (4/9) × 63 = 28 N.
8.16. Assuming the earth to be a sphere of uniform mass density, how much would a body weigh half way down to the centre of the earth if it weighed 250 N on the surface? 8.17. A rocket is fired vertically with a speed of 5 km s–1 from the earth’s surface. How far from the earth does the rocket go before returning to the earth? Mass of the earth = 6.0 × 1024 kg; mean radius of the earth = 6.4 × 106 m; G= 6.67 × 10–11 N m2 kg–2. = 6.4 × 106 + 1.6 × 106 = 8 × 106 m.
8.18. The escape speed of a projectile on the earth’s surface is 11.2 km s–1. A body is projected out with thrice this speed. What is the speed of the body far away from the earth? Ignore the presence of the sun and other planets. Gravitational potential energy of the projectile far away from the Earth is zero. = √8 × 11.2 = 31.68 km/s. 8.19. A satellite orbits the earth at a height of 400 km above the surface. How much energy must be expended to rocket the satellite out of the earth’s gravitational influence? Mass of the satellite = 200 kg; mass of the earth = 6.0 ×1024 kg; radius of the earth = 6.4 ×106 m; G = 6.67 × 10–11 N m2 kg–2. The negative sign indicates that the satellite is bound to the Earth. This is called bound energy of the satellite. = 5.9 × 109 J. 8.20. Two stars each of one solar mass (= 2× 1030 kg) are approaching each other for a head on collision. When they are a distance 109 km, their speeds are negligible. What is the speed with which they collide? The radius of each star is 104 km. Assume the stars to remain undistorted until they collide.  (Use the known value of G). v = ( 6.67 × 1012)1/2 = 2.58 × 106 m/s. As the effective force on the body placed at mid-point is zero, sso the body is in equilibrium. If the body is displaced a little towards either mass body from its equilibrium position, it will not return back to its inital position of equilibrium. Hence, the body is in unstable equilibrium. 8.22. As you have learnt in the text, a geostationary satellite orbits the earth at a height of nearly 36,000 km from the surface of the earth. What is the potential due to earth’s gravity at the site of this satellite? (Take the potential energy at infinity to be zero). Mass of the earth = 6.0 × 1024 kg, radius = 6400 km. = -9.4 × 106 J/kg. 8.23. A star 2.5 times the mass of the sun and collapsed to a size of 12 km rotates with a speed of 1.2 rev. per second. (Extremely compact stars of this kind are known as neutron stars. Certain stellar objects called pulsars belong to this category). Will an object placed on its equator remain stuck to its surface due to gravity? (Mass of the sun = 2 × 1030 kg). A body gets stuck to the surface of a star if the inward gravitational force is greater than the outward centrifugal force caused by the rotation of the star. Since fg > fc, the body will remain stuck to the surface of the star. 8.24. A spaceship is stationed on Mars. How much energy must be expended on the spaceship to launch it out of the solar system? Mass of the space ship = 1000 kg; mass of the Sun = 2 × 1030 kg; mass of mars = 6.4 × 1023 kg; radius of mars = 3395 km; radius of the orbit of mars = 2.28 × 108kg; G= 6.67 × 10–11 m2kg–2. Since the spaceship is stationed on Mars, its velocity and hence, its kinetic energy will be zero. = 596.97 × 109 = 6 × 1011 J. 8.25. A rocket is fired ‘vertically’ from the surface of mars with a speed of 2 km s–1. If 20% of its initial energy is lost due to Martian atmospheric resistance, how far will the rocket go from the surface of mars before returning to it? Mass of mars = 6.4× 1023 kg; radius of mars = 3395 km; G = 6.67× 10-11 N m2 kg–2. If 20 % of initial kinetic energy is lost due to Martian atmospheric resistance, then only 80 % of its kinetic energy helps in reaching a height. At this height, the velocity and hence, the kinetic energy of the rocket will become zero. = 495 × 103 m = 495 km.